Jakarta, 6 September 2018 – PT Pertamina Lubricants once again shows its consistency in strengthening Pertamina’s lubricant brands with continuous innovations to meet the needs of domestic and foreign lubricants demands. At the 4th ASEAN MARKETING SUMMIT 2018 Indonesia Champion for ASEAN 2018, Pertamina was awarded a prize in the Automotive, Transportation & Logistics category, received directly by the Sales & Marketing Director of PT Pertamina Lubricants, Andria Nusa, at the Raffles Hotel, Jakarta. The prize was awarded by MarkPlus, Inc. in collaboration with Philip Kotler Center for Asean Marketing (PKCAM) due to the recognition of PT Pertamina Lubricants as a national lubricant company that has invested and succeeded in developing its business not only locally, but also internationally, especially in the ASEAN region. With its various superior brands, including Fastron, Enduro, and other various industrial lubricants, PT Pertamina Lubricants has succeeded in establishing a step towards becoming a world-class Lubricant company by expanding its market coverage. 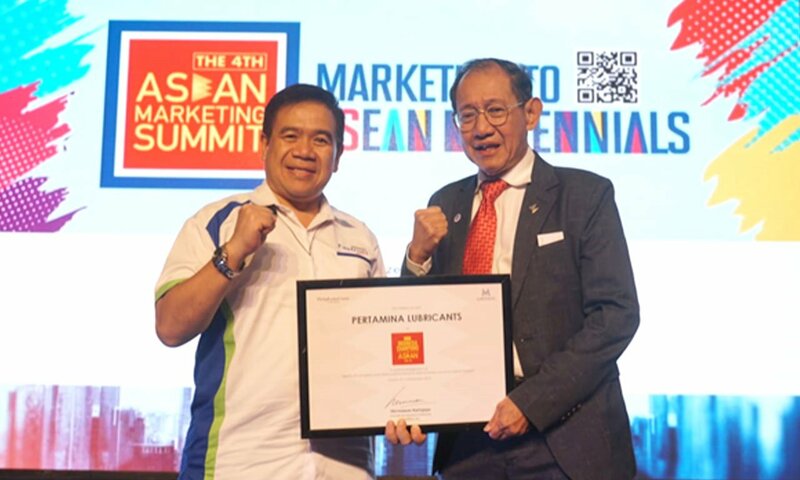 In accordance with this year’s theme, “Marketing to ASEAN Millenials”, PT Pertamina Lubricants has managed to maintain its position as a market leader in the domestic market by continuing to strengthen its network and marketing strategy in compliance with the market trends, technology trends, consumer development trends, and digitalization trends which has been rapidly adopted by today’s customers. To build a brand in the international market, Pertamina Lubricants has collaborated with ATPM International manufacturers and world class supercar brands, Automobili Lamborghini, Squadra Corse division, to develop Fastron Platinum Racing. Pertamina Fastron Platinum Racing is the official lubricant used by Automobili Lamborghini for each motorsport event handled by the Lamborghini Squadra Corse team, Lamborghini Super Trofeo and Lamborghini GT3. In addition, PT Pertamina Lubricants has expanded to 14 countries with 16 authorised distributors abroad. To penetrate to international market, Pertamina Lubricants is actively exploring strategic cooperation with multi distributorships to open new opportunities and speed up market penetration. In March 2018, PT Pertamina Lubricants expanded its business in Australia by opening the Australian Pertamina Lubricants Representative Office in Sydney to strengthen global market networks while introducing world-class Lubricants products made in Indonesia to the world. In addition, by opening representative office in Sydney, PT Pertamina Lubricants is committed to provide leading services for consumers in Australia. Pertamina Lubricants have also expanded markets in overseas including South Africa, Australia, Nepal, Bangladesh, Nigeria, Malaysia, the Philippines, Singapore, Cambodia and Thailand. Specifically, PT Pertamina Lubricants has also taken over AMACO Production Co. Ltd, a lubricant manufacturer in Bangkok. The acquisition is the company’s main strategy to increase penetration in Thailand and Indochina. Pertamina Lubricants has developed product innovation and brand development to meet current market needs by creating new products based on cost leadership, technology and innovation, which are tailored to the needs of the automotive industry and various sectors of national industries.